Players often need to rely upon something else except for their strategies, in order to win at the game. Many times this outside help comes in from various types of spells for luck, lucky items like mojo bags and lucky oils. Given below are some interesting things that players often use to improve their luck. Probably the most famous gambling charm is the mojo bag which is very widely used by players. Mojo bags are actually small leather or flannel bags which are filled with lucky curious or herbs and are carried by players when they go to a casino. These can include things like five finger grass or lucky hand root, which can bring in luck and help in the all things which can be done with the five fingers. Several people like to carry a conjure bag or a mojo hand as it is known to the casinos for increasing their luck at the game. All mojo hands or mojo bags are filled with minerals, herbs or roots which are thought to be lucky for increasing winnings and drawing money like lodestone, iron ore, rabbit foot, lucky hand root, five finger grass, cinnamon chips, golden iron ore etc. Several stores sell these mojo bags with the instructions for using them. Though it might sound unbelievable, in the ancient days the gamblers used to dress their mojo bags with the urine or their partner or with whisky! These herbs are known to bring in money. 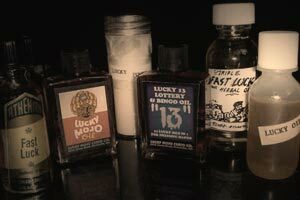 Several other players also use lucky dressing oils instead of using herbal lucky hand washes or carrying mojo bags. Basically lucky oils are made with the same type of herbs which are used in hand washes. Several players carry these lucky oils with them to the casinos and they put some on their hands before they begin playing. While many others anoint their money before they purchase lottery tickets and dress their chips and coins with them before they use them at the casino. Many players even perform elaborate rituals and have certain lucky spells which they swear brings them luck every time they go to a casino. There are many books which have lucky spells especially for bringing in luck for gamblers and many websites too these days have instructions on performing these rituals before going to casinos. These were just a few things that players around the world do in order to bring in luck and money when they go to a casino. Every player has his/her own beliefs about what works and what doesn't work for them; and all of them have their own lucky rituals to bring luck in gambling.